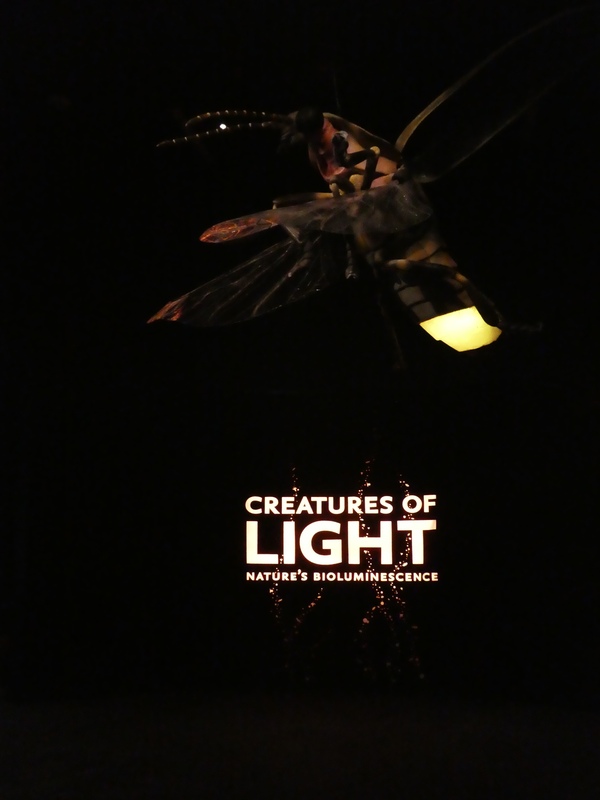 These creatures light up. We don’t. 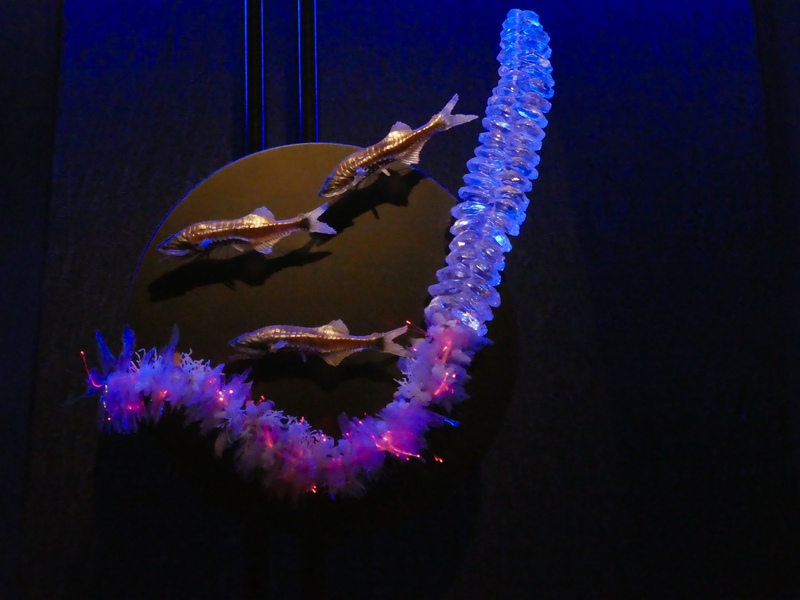 Yesterday at the Denver Museum of Nature and Science, we saw animals with bioluminescence and biofluorescence, from tiny fireflies to strange creatures in the ocean depths. Let’s explore! That is a giant firefly. You will notice that it is dark in here, so pictures of us with these lighting creatures just doesn’t work well. So what does this bioluminescence mean? 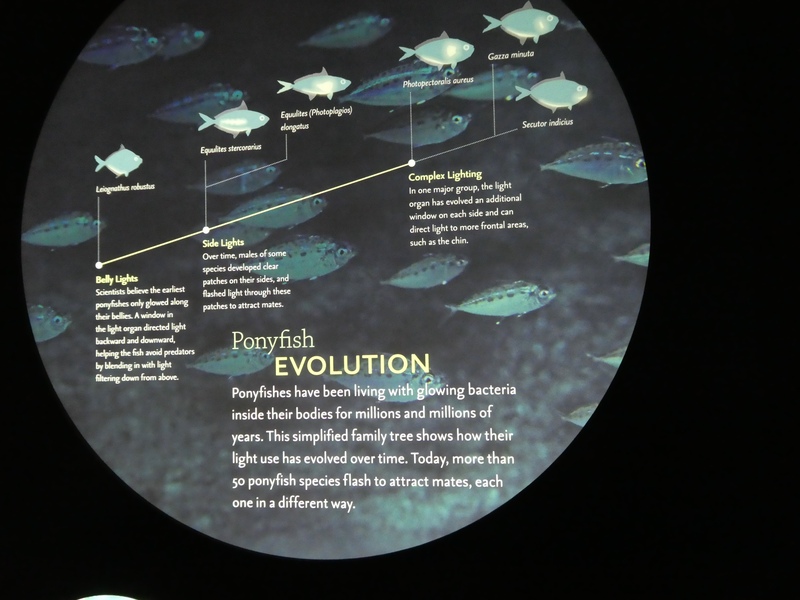 Bioluminescence is visible light generated by a living organism through a chemical reaction. Eighty percent of all bioluminescent groups are in the world’s oceans. Not so many on land. 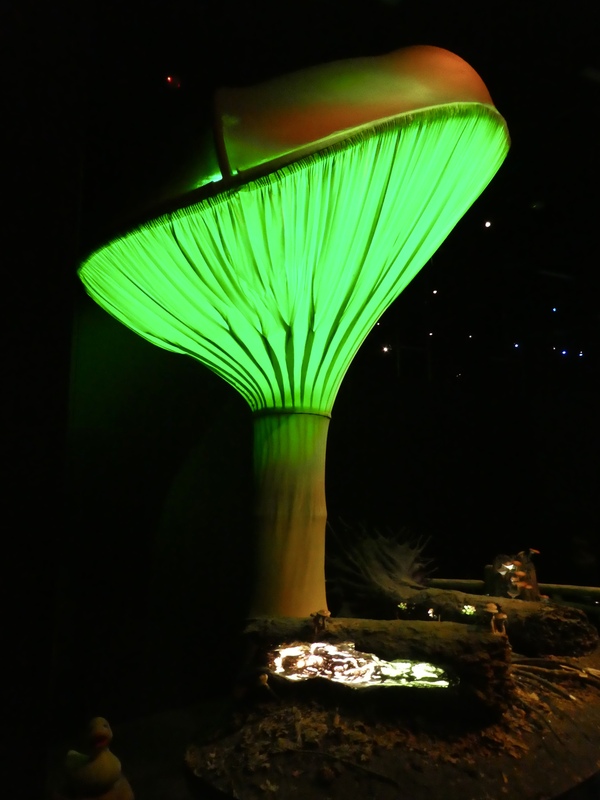 There are some fungi and insects, but no flowering plants, birds, reptiles, amphibians or mammals that glow. Look at this glowing mushroom. It exists in eastern North America, where it grows on decaying wood in the forests. This is a huge model of the mushroom. They are really much smaller, just a normal mushroom size. 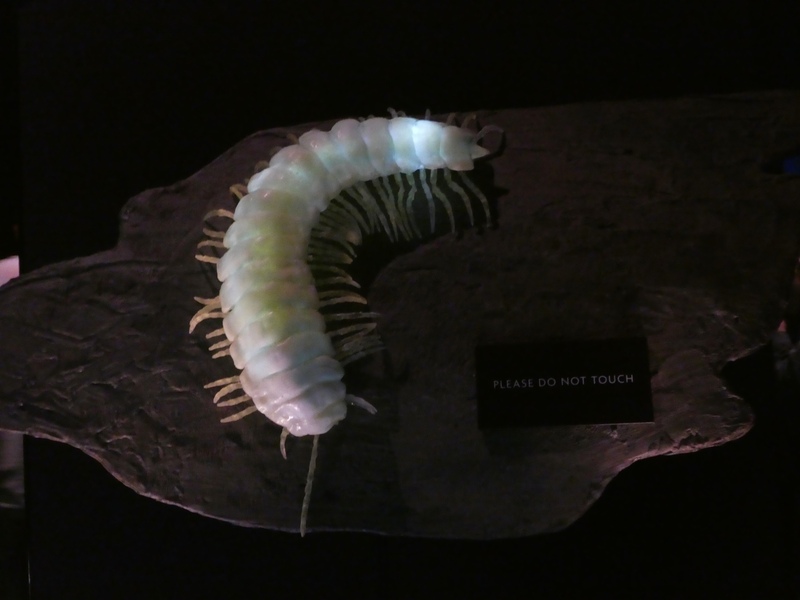 And a glowing variety of a millipede. We have never seen these, but they are fascinating. 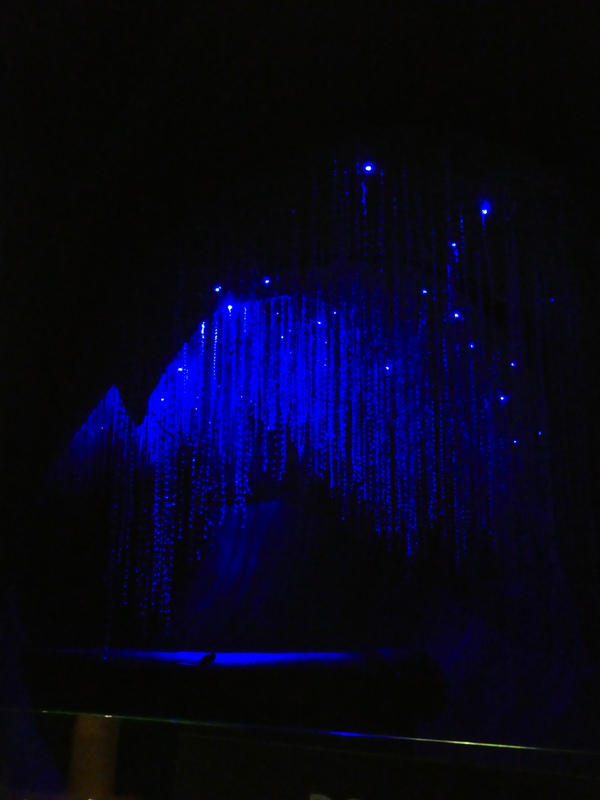 And a dark New Zealand cave with simulated glowworms. In the cave, fungus gnat larvae drop sticky “fishing lines” from the cave roof. Glowworms give the light and the sticky lines attract and catch food. Most glowing creatures are found in the ocean. Ponyfish also glow. Here is the sign that explains a little about the glow. Ponyfish are called Sapsap in the Philippines, where there are caught in huge numbers for soups and stews. Guess they don’t glow when cooked. These jelly fish, if poked or jostled, light up their rim. 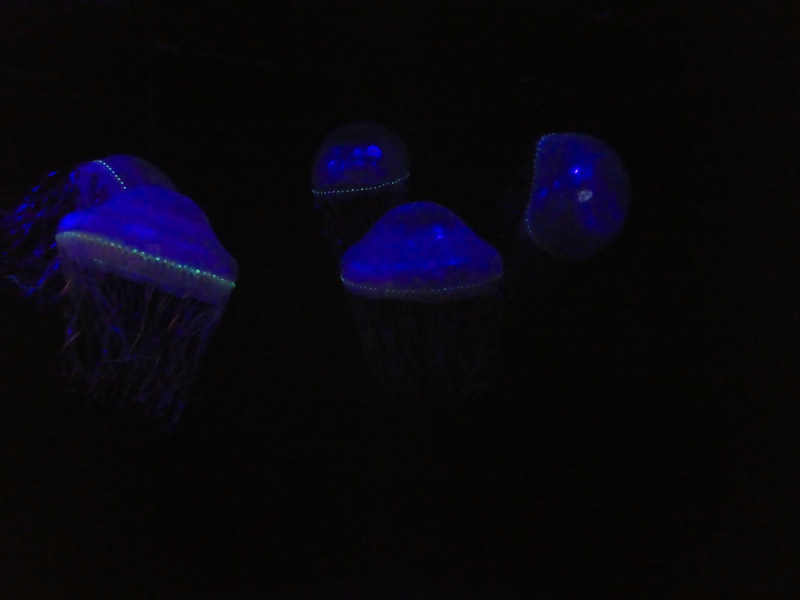 The jelly fish have both bioluminescent and fluorescent lighting. 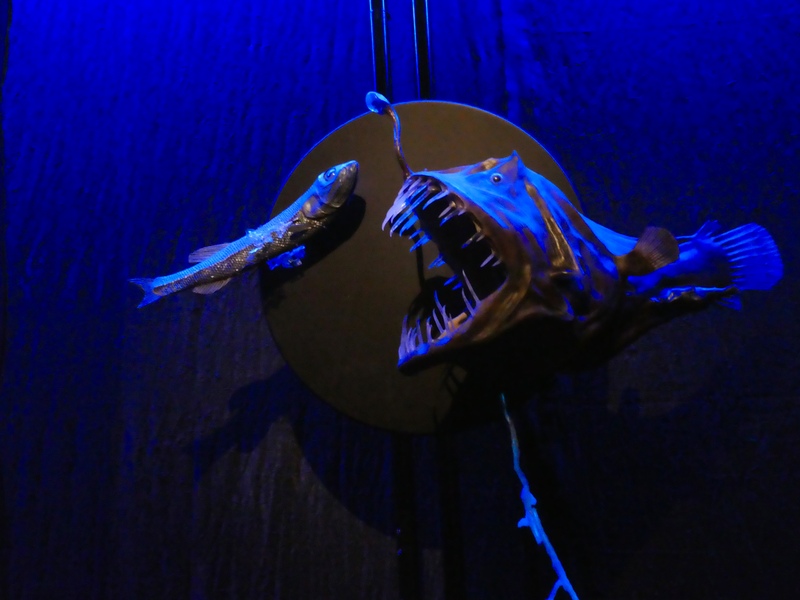 This female anglerfish is a serious predator. Have you ever heard of siphonophores? Well, here is one and do you know how big they can grow? Some are 130 feet long (40 meters). That is longer than the largest known blue whale. They attract fish for food by twitching and using light. And the dinoflagellate became our favorite. 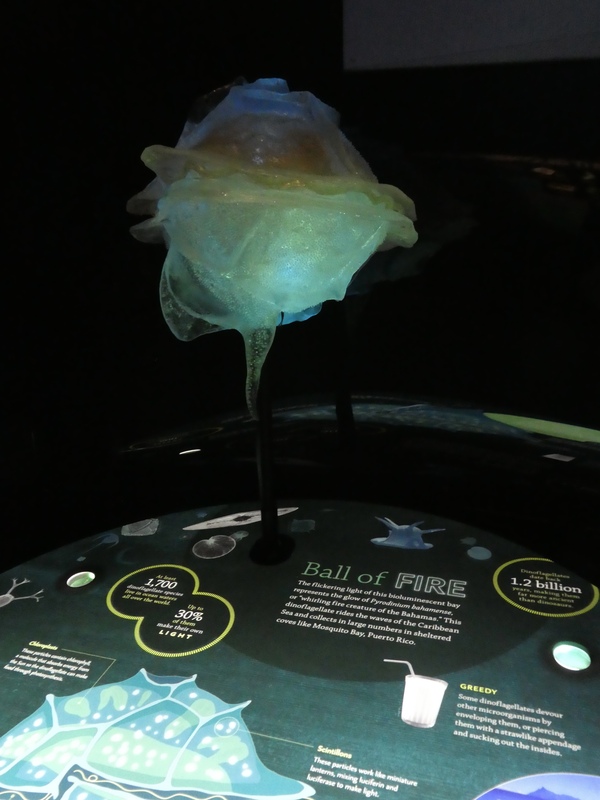 This model is huge, but a real dinoflagellate is about the size of the head of a pin. Dinoflagellate. Really the size of a pin head. When something bumps into a dinoflagellate, the impact triggers a chemical reaction that ends in a burst of light. This is very active in Mosquito Bay, a quiet lagoon on the island of Vieques in Puerto Rico. When you touch the waves at night, your hand leaves a trail of sparks in the water. The more activity, the more bright lights. We have never seen this, but mom, we want to. Can we go to the Caribbean?? There is so much more to see here and you will learn so much. The exhibit runs until June 10, 2018. When it leaves Denver, it may be coming near you. We hope you see this exhibit. In Denver, the exhibit is free with your paid admission to the museum. But beware, as the ducks said, you will want to visit everywhere and see some of these creatures for yourself. But take the risk and visit this exhibit.